Lotto Central Affiliate Program | Lotto Central - Play For FREE! Thank you for your interest in the Lotto Central Affiliate Program. We believe our Affiliate Program is the easiest and potentially the most profitable on the internet. You’ll earn 25% commissions when you find people interested in sharing a multi-million dollar jackpot. There is no cost to participate in our Affiliate Program, but to be paid on your referrals that become a paid Subscriber, you must be a paid Subscriber yourself. It’s fun. It’s engaging. It’s profitable. Consider this. Anyone may play at Lotto Central for free. They may do so for as long as they like. That keeps your referrals entertained and engaged. Your referrals will soon understand the potential cost of forgetting to register and the earnings they might enjoy by becoming affiliates themselves. Then, it’s likely they’ll become a paid Subscriber. A Player pays as little as $1.00/month to maintain their paid status. If a person is a paid Subscriber, they need do nothing more for the duration of their paid period. They participate in our game as we play day end and day out with no requirement to register for each game individually. There are other significant benefits for becoming a Paid Subscriber. Through our regular reporting, we remind your referrals of the benefits of Subscription. We encourage them to Subscribe and become paid affiliates themselves. This helps both to solidify your affiliate base and perpetuate your earnings. Their Subscription investment is trivial and assures them of an equal share of the millions when we hit the jackpot. That helps drive your Subscription sales. When their current Subscription period expires, we undertake a powerful effort to remind your referrals of the benefits they’re receiving. As a result of our efforts, they’re likely to remain a paid Subscriber over and over again. That helps drive your residual income far into the future. When your referred affiliate renews, you’re compensated again. A single referred affiliate could be worth a great deal to you through the duration of their paid Subscription. Your referred paid Subscribers are now qualified to begin earning with their own affiliates. That further solidifies their participation and helps assure your earnings for years to come. As a Lotto Central Affiliate, you’ll continue to refer players while watching your potential recurring income grow. This is a tremendous opportunity for anyone who knows others interested in sharing a multi-million dollar jackpot. Who do you know that would like to share the millions? 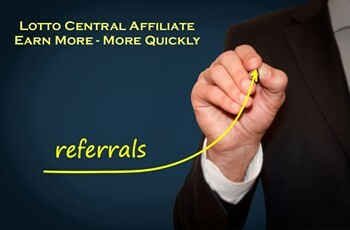 Once you’re a Lotto Central affiliate and have become a paid Subscriber, you will receive a 25% commission on all of your referrals that do the same. Your referrals can begin playing for free. When they decide to become a paid Subscriber you’ll be compensated as long as you’re also a paid Subscriber. You’ll also be compensated when they renew for as long as your paid Subscription remains active.